Bird parents, like many human mothers and fathers, often struggle to become empty nesters. But as new research suggests, the tension that arises between baby birds who don’t want to leave the nest and parents who would very much like them out ultimately results in an ideal departure time that boosts survival rates. Every bird you see outside your window is a survivor. The war of attrition that is evolution guarantees that only the fittest survive, but often at tremendous cost. In juvenile birds, for example, mortality rates during the first three weeks outside the nest range from between 12 per cent to an astounding 70 per cent, depending on the species. Needless to say, baby birds need to to leave their nests at the right stage of development to boost their chances of making it to adulthood. New research published last week in Science Advances shows that, for several species of songbirds, staying in the nest for extended periods allows baby birds to develop wings that are better suited for flight, which ultimately helps them to survive outside the nest. At the same time, however, parents would rather see an earlier departure. Surprisingly, this previously undocumented tension actually results in a leave-taking that Goldilocks herself would be proud of — an exit time that’s not too early or too late, according to University of Montana researcher Thomas E. Martin, author of the new study. 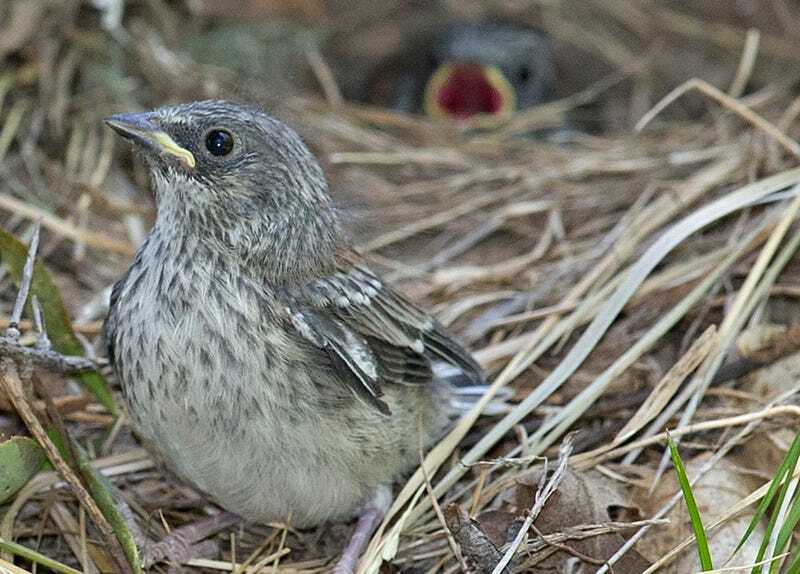 A young grey-headed junco has just left home, with its sibling still in the nest in the background. Notice the under-developed nature of wings when they leave the nest. For songbird nestlings on the cusp of fledglinghood, it’s a kind of damned-if-you-do, damned-if you-don’t situation. If a baby bird leaves the nest too early, when its wings aren’t yet fully developed, it’s at greater risk of being caught by predators. But the nest itself isn’t always a safe space, as it’s vulnerable to squirrels, chipmunks, jay birds, and snakes. At the same time, evolutionary “success” holds a different meaning to the fledglings than it does to the parents. For the fledgling, success is measured by pure survival outside of the nest, but for the parents, it’s the guarantee that at least one of their brood survives. Hence the desire among songbird parents to get their chicks out into the real world as fast as possible, since when a predator attacks a nest, it typically kills the entire brood, and none of the parent’s genetic material get passed down to the next generation. But fledglings who have left the nest are spread out and mobile, dealing with life on their own terms, and independently fending for themselves. To facilitate departure, parents hold food away from the nest and encourage their young to come and get it. But mum and dad are not in total control — the youngsters are also capable of manipulation, and their incessant begging often causes the parents to cave. “Thus, offspring fledge [i.e. leave the nest] at an age that is later than optimal from the parents’ perspective and earlier than optimal from an offspring’s perspective, yielding a compromise between parents and offspring that balances risk of mortality in versus out of the nest,” write the researchers in the study. To show that it’s advantageous for baby birds to stay in the nest for longer periods of time (at least as far as wing development is concerned), Martin and his colleagues used high-speed video to compare falling golf balls to wild birds making their first flights. Sound silly, but this allowed the researchers to measure the rate at which an inanimate object falls compared to a bird trying to fly for the very first time. In terms of performance, the researchers were looking at the birds’ ability to slow their descent, or fly in a sustainable manner. Eleven different species of songbirds were studied, including mountain chickadees, western blue birds, house wrens, and the white-breasted nuthatch. The researchers also accounted for the age of the birds at first departure, and variations in wing growth rates. Grey-headed juncos leave the nest at a young age because their ground nests are at high risk of predation. This young age of departure results in under-developed wings that do not allow sustained flight, even the day after they left the nest, as this footage demonstrates. Radio transmitters were placed on eight species of the songbirds to see if they were still alive seven days after leaving the nest. The researchers also studied the rate at which baby birds were killed in the nest, in order to determine if birds were truly leaving at an optimal time. And in a side experiment, the researchers delayed the expected departure time in some birds by holding them back for three days to see how’d they fare when their wings were more fully developed. The results were not entirely surprising. The poorer the flight performance exhibited by a bird, the greater chance it had of being killed by a predator. What’s more, poor flight performance was tied to younger fledging ages. Results from the side experiment further corroborated these findings. What’s more, the data also showed that the push-and-pull between nestlings and their parents resulted in an optimal departure time that minimised mortality. These results only apply to the eight songbird species studied, so more research could show whether the same principle applies to other species. “In addition, fledgling survival was only measured for the first week after leaving the nest, and ramifications of differences in development at fledging may yield different results on survival over the longer term, such that study of survival for a longer period after leaving the nest would be useful,” Martin told Gizmodo.